a Class*y Collaboration: Let the Planning Begin! Hello there! This is Ciera from Adventures of Room 129 :) Since we are all getting into that 'Back to School' mode (whether we like it or not!) I've decided to share with everyone my lesson plan template. I worked really hard on it and am super excited to start using it this year :) Wanna see it? Just click the photo below to read all about it! If you like it enough, there are even links to download a FREE copy (PDF or Word)! Let me know what you think! I'm super excited that you have all joined us here at A Class*y Collaboration! 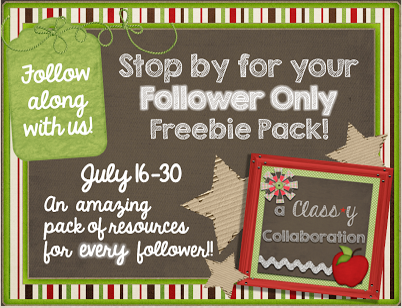 This is going to be a FANTASTIC place for ideas, lessons, freebies, and much more! If you haven't already - you probably want to head back to our "Giveaway" post and enter. Why did I put "Giveaway" in quotation marks?? Because - EVERYONE wins!! All you have to do is be a follower and you've automatically won a huge packet put together by all of the amazing bloggers worth almost $30! If you haven't done so, go ahead and enter now! AND one lucky winner will get a $50 gift card of his/her choice! Don't miss out!! Just click on the photo below to head back to that post! I like your lesson plan template. It looks really good. Year before last we started using planbook.com to type in our lessons and it lets you attach the standards for cc and your state essential standards. After some of us started using it the admin loved it so much they bought a school subscription. I miss written plans sometimes but have gotten to where I love that if I don't finish something I just bump it into the next days plans and it is already there. Good luck getting going, I am trying to finish reading all my summer education books so I can get more motivated, lol. I've never heard of planbook.com! It sounds fantastic. :) I've tried lesson planning on the computer but felt although convenient, it took me more time than writing things down would. I'm so particular about how things look that it would take me just as long to format everything to look nice as it would to actually plan! Haha. That's the teacher OCD in me! Good luck finishing your books and enjoy the rest of your summer! I'm a FAN, are you? Re-purpose, Recycle, Reduce...& a WiNnEr! Flash Freebie on Multisyllable Words! Hey Y'all, Welcome to our new Adventure! Hello, Hello! And a FREEBIE for you!! Reading Genre Cards- Hello and a Freebie!